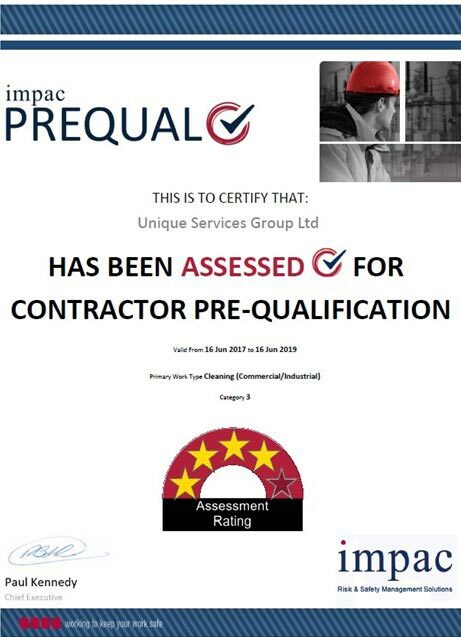 Here at Unique Services Group (USG) we pride ourselves in having the highest standards in both Health and Safety and Environmental Care. This is the starting point for our staff training. We are CPNZ (Contractor Prequalification NZ) qualified and under the Health and Safety Law, this means we hold the safety of our staff and our Clients’ staff to the highest standards at all times – so you know you are working with the best. We are a “Fonterra Approved” contractor able to work on any site in New Zealand. This is only half the safety storey – the other half is the safety plant and equipment that we own and operate, much of it custom made for our needs. Below are some of the qualifications many of our staff have achieved since working with us. Unit Standard 17602 – Apply hazard ID and risk assessment procedures in the workplace. Training provides methodology for identifying hazards and implementing controls. Knowledge and skills required to identify hazards in the work place and prevent potential accidents are developed. Unit Standard 17588 – apply for, accept, and carry out work according to a work permit in the workplace. Training to develop the skills for pre-determining the work to be done, expose the hazards of the operation and state the method of control. Course provides training in chemical identification and hazardous substance evaluation. Strong emphasis placed on handling, storage and segregation. Also covered is spill contingency, inventory, disposal methods and first aid. Review of legislation, regulations and guidelines. Unit Standard 9184 – Erect non-notifiable prefabricated scaffolding. The unit standard enables people to erect or alter temporary working platforms to the requirements of the Health and Safety in Employment (HSE) regulations, in trestles and prefabricated steel or aluminium for scaffolding up to 5 metres in height. This is a much more comprehensive course than “Site Safe”. Among other items there is a comprehensive section on Accident In Investigation for workplace accidents. Describe the “what”, “how”, and “when” of cleaning for food plants. This is carried out by JLG Industries based in Mt. Wellington and we have our own JLG access equipment. Our staff are continuously training and up-skilling to ensure the best service and knowledge is available to our valued clients. All staff are inducted and trained in the correct handling and application of all USG plant and equipment.